YEAR So. So. Jr. Sr.
On March 10, 2008, the Kansas City Star reported “Kansas lost a legend on Monday when Otto Schnellbacher, one of the greatest athletes in school history, died of cancer at the age of 84.” Schnellbacher was one of the rare KU athletes to have played professionally in both the NFL and NBA. Known as the ‘Double Threat from Sublette’, the 6’4 Schnellbacher played both football and basketball at KU, first in 1943, and then from 1946 to 1948 after returning from World War II. Teaming with Charlie Black and Ray Evans in basketball, Otto was a four-time all-conference selection, averaging 11.0 points per game for his career. “Phog Allen liked football players,” said Schnellbacher. “He liked toughness, people who could knock people down.” Former basketball teammate Jerry Waugh said that “The thing that stood out about Otto was his leadership. You better give 100 percent on every single play or you had to answer to him.” Schnellbacher served as both class president and team captain while at KU. 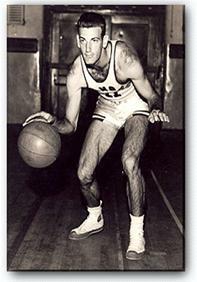 After graduating, Schnellbacher spent the 1948-49 season in the NBA with the St. Louis Bombers and the Providence Steamrollers. He was drafted by the NFL Chicago Cardinals in 1947 and by the New York Yankees of the All America Football Conference in 1948, who he joined for the ‘48 and ‘49 seasons. He then played for the New York Giants in 1950 and 1951, earning All-Pro honors as a defensive back both seasons. He led the NFL in interceptions with 11 in 1951. He never stopped working for his alma mater, according to friends. He served as the first president of the K-Club and kept the Quarterback Club strong in Topeka through the years. He served KU as a Greater University Fund Advisory Board member and served on the Gold Medal Club for the KU Alumni Association. Schnellbacher is one of 15 former KU football players whose name is displayed in the Ring of Honor around the top edge of Memorial Stadium. He has been inducted into the Kansas Sports Hall of Fame and the Kansas University Hall of Fame. KU and the Alumni Association also conferred the Distinguished Service Citation to Otto for his significant contribution to humanity.